Published on June 14, 2016 by Martyn. Be the first to comment! 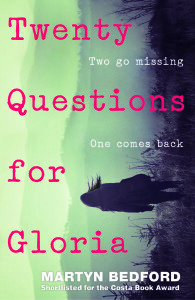 I’m clocking up the miles in the next week as I take Twenty Questions for Gloria on another mini-tour. On Thursday, I’ll be spending a day at Merchant Taylors’ School, in north London, where I’ll be giving talks and readings and running a creative writing workshop. Then, on Saturday (June 18th), I’m at Birmingham Waterstones for a YA ‘Thrills and Chills’ panel event, sharing a stage with Cat Clarke (The Lost and the Found), M.A. Griffin (Lifers) and Sue Wallman (Lying About Last Summer). For details of this event, which starts at 6pm, please click on this link to the bookshop’s website. The mini-tour ends closer to home next Monday (20th), with another school visit. This time I’ll be taking part in a curriculum enrichment day at Allerton High School, in Leeds, running two creative writing workshops as part of Ilkley Literature Festival’s schools programme.